While 2011 marks the 25th anniversary of the entire Legend of Zelda Series, May 14th 2011 marks 10 years since Oracle of Ages and Oracle of Seasons were released in North America. As always Japan was earlier in February, and the rest of the world had to wait until October. Upon release the Oracle games were largely praised, receiving review scores ranging from low nineties right up to some perfect 10/10s. 10 years later they are still considered to be two of the best Game Boy Color games, so join us as we reflect back on a decade of the Oracle series. The development process begun when Capcom, or specifically a subset of Capcom called Flagship, approached Nintendo on remaking the original Legend of Zelda for the Game Boy Color. Conversations then went on to also remaking the Adventure of Link, as well as then moving on to some new games. In the end, two games were agreed upon, and the final result was the Oracle series. A third title was considered, given that one of the games is about Din and the other about Nayru. However instead of making the Oracle Series a trio to have a game about Farore, the concept of linking the games through passwords came about. Through this Link got to work with Farore, the Oracle of Secrets, to uncover hidden items. Now although we know Capcom and Nintendo settled on two exclusive new titles and no remakes, majority of the graphics for the Oracles series were actually taken directly from Link’s Awakening. Those who have played Link’s Awakening know that it has somewhat of a quirky nature, and that’s something the Oracle games offer a tribute to, especially through some pretty random animal companions: Moosh the flying blue bear, Ricky the boxing kangaroo, and Dimitri the red dodongo. While both Oracle of Ages and Seasons offer different dungeons, slightly different gameplay and differences in the story, they both follow a very similar formula. They detail the stories of Twinrova trying to light the Flame of Sorrow in Oracle of Ages and The Flame of Destruction in Seasons. Ages takes place in Labyrnna, where Veran takes control of Nayru, the Oracle of Ages. Link uses the harp of Ages to control the flows of time and save the day. On the other hand, Seasons takes place in Holodrum, where Onox plans to abduct Din, the Oracle of Seasons. This time Link uses the Rod of Seasons to control the essences of nature to thwart Twinrova’s plans. Although unquestionably similar, Nintendo and Capcom made sure that playing both of the Oracle games, instead of just choosing one like people do with Pokemon, offered a unique experience. They were successful with this, but took it further by offering bonuses to those who played both games. This is where the linking system using passwords comes into the picture. Through receiving passwords in one game and entering them into the other game, players got extra content, and a combined storyline that is the true ending to the Oracle series. In the linked game both Veran and Onox are defeated, and then Twinrova manages to resurrect a somewhat deformed Ganon. Link defeats this idiotic Ganon, destroying Twinrova’s plan. The Master Sword also made an appearance exclusively through linking the games. Linked gameplay was a fundamental part of getting the true Oracle experience, and was yet another unique approach to gameplay conceptualized in a Zelda game. Nintendo must have been impressed with what Capcom accomplished, because Flagship would go on to also develop Four Swords and The Minsih Cap for the Game Boy Advance, which inspired Nintendo to create Four Swords Adventures themselves. While Phantom Hourglass and Spirit Tracks are fantastic portable games, the general consensus is that they suggest Zelda should stick to home consoles. On the contrary, Link’s Awakening along with Capcom’s The Minish Cap, and of course, the Oracle duo, prove that Zelda also dominates handheld consoles, providing some of the best portable gaming experiences we’ve ever had. It makes you wonder whether we’ll ever see Capcom and Flagship behind another portable Zelda title again. So integral to many Zelda fans is the Zelda timeline, and the Oracles presented a challenge for fans to piece together the mysteries of the Zelda chronology. Initially many fans tied it to A Link to the Past, and some to Link’s Awakening, stating that the ending of the linked games has Link on the boat that begins Link’s Awakening. With the later revelation of the split timeline, some fans claim the Oracle duo to be corresponding, or parallel games, on each of the child and adult timelines. Some go as far as to say that the linked ending connects the split timeline back together again. Many theorists believe that the two games can’t be separated and individually placed, and therefore indicate the whole Oracle Series on their timeline using the abbreviation “OoX”. Important to note when considering the chronology in the case of the Oracle series is that it takes place at a time where the Triforce is in Hyrule castle, and Ganon is dead. This leads to the most widely accepted timeline placement of the Oracle titles, which is on the adult-arc, occurring post Spirit Tracks and after the original two games, but preceding the Four Sword series, which leads into A Link to the Past. Of course, all of this is subjective, and you will likely have your own and potentially conflicting ideas; but nevertheless, the Oracle duo provides a challenge to any chronologist. With the approaching launch of the 3DS eShop, hopefully we will see Oracle of Ages and Oracle of Seasons available to download to the Game Boy virtual console. If you haven’t experienced the Oracle Series, this is your best hope because locating the original cartridges can be challenging, time consuming and eat up a fair amount of money; but eBay is your best bet. If you already have a copy, whether you’ve finished them or not, now is the time to pick them up again and celebrate a decade of the Oracle games. With all of the differences between the two, you can be sure that one of their similarities is a focus on action based gameplay. 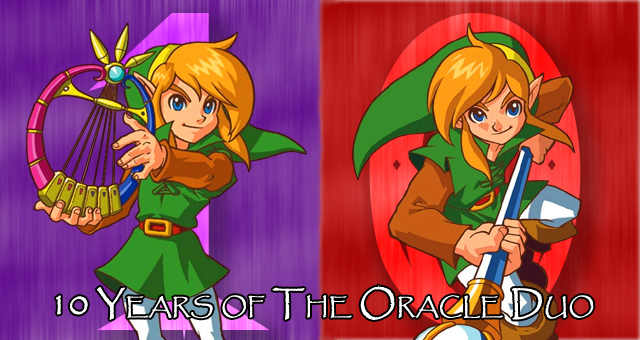 Happy 10th anniversary to The Legend of Zelda: Oracle of Ages and the Legend of Zelda: Oracle of Seasons!